1. As commonly used today: Bending with heart-shaped tooling. See cavity. 2. An older method of bending in which the tube is clamped against a stationary bend die and the pressure die sweeps the tube around the bend die to form the bend. This differs importantly from rotary-draw bending in that the point of bend is the point of contact between the pressure die and bend die. Therefore the point of bend moves through space, which makes the use of a mandrel impossible. 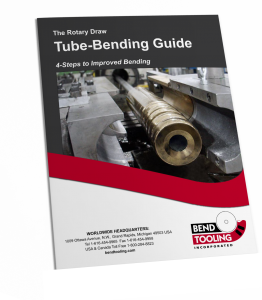 Compare rotary-draw bending.